Minister of Sports, Solomon Dalung has endorsed the Rivers State Governor, Nyesom Wike for a second term. Wike is a member of Nigeria’s main opposition party, the Peoples Democratic Party (PDP). Dalung stated that the Rivers State Governor has lived up to the expectations of his people, hence the need to be rewarded with an additional term in office. Dalung spoke at the Diete Spiff Civic Centre, Port Harcourt on Monday during the opening ceremony for the Governor Nyesom Wike National Wrestling Championship organised by the Nigerian Wrestling Federation . 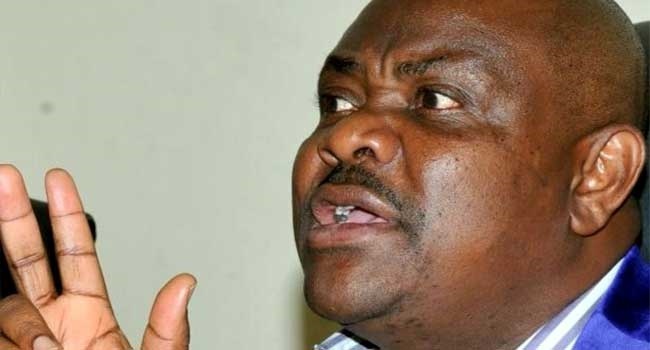 He said the 2019 General Elections would be a time for all political leaders to give an account of stewardship, pointing out that only performing leaders like Governor Wike would be successful at the polls. “I know you people will re-elect Governor Wike because of his good works in Rivers State.In 2019, anyone who believes in unnecessary talks should be checked with the question, the mandate we gave you, what did you do with it”. Dalung challenged anyone who is ‘angry’ that Mr. Wike is hosting the championship to bring his money and do the same. This is not the first time a member of President Buhari’s cabinet will be making a controversial endorsement. Earlier this year, Aisha Alhassan, the Minister for Women Affairs, endorsed a former vice president, Atiku Abubakar, for the 2019 presidential election.